Ron Brown was another failed attempt to convert a track star into a pro wide receiver. He certainly had the speed to go deep, but that was about all he could do, and he dropped at least half of what was thrown at him. 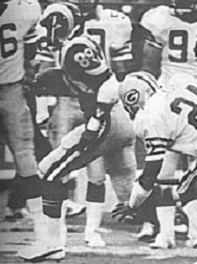 Teams would routinely double up on his partner Henry Ellard, who had both the speed and ability to run multiple routes and catch in traffic, and all but dare Brown to hang onto the ball. It wasn't until his slot was filled by Flipper Anderson that the Rams (with Jim Everett at QB) finally had a feared passing attack.